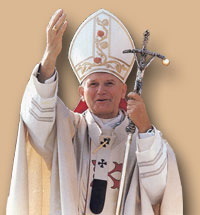 Pope John Paul II wasn't able to speak on Easter, but he did go to the window and bless the crowd gathered there at St. Peter's Square. Even for us non-Catholics, that was encouraging news, since we all share concern for his health. During the Pope's recent medical problems, the Vatican has encouraged people everywhere to pray that John Paul be blessed..... and strangely, that always brought to mind a story the late Rosemary Clooney used to tell during her concerts. I don't recall the entire story, but I do recall the ending, and I'll get to that in just a minute. My parents often listened to Rosemary Clooney's music, so I became a fan at a very early age. I met her once at CBS Television City when I was working on The Pat Sajak Show in Los Angeles. As a matter of fact, when people inquire about my favorite musical performance on the Sajak show, I quickly answer Rosemary Clooney. 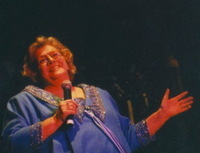 She performed a song titled "Where Do We Start", from her 1989 album Show Tunes. She was accompanied only by her pianist. And even with the simplicity of the musical arrangement, everyone on the staff -- including our own band members -- agreed, it was the most spellbinding and moving performance ever on the show. After the show, I chatted with Rosemary backstage about some mutual friends from Maysville, Kentucky -- and, of course, complimented her performance. A few days later I received from her a nice little note, along with a cassette of the album that included the song she had performed that night. Such a nice and unexpected gesture. Anyhow, back to the original story. A few years ago, my wife and I -- accompanied by James Lewis and his wife Lois -- attended a concert featuring Rosemary Clooney and the Nashville Symphony. That night, and apparently whenever Rosemary performed, she would tell the story of visiting the Vatican and having the opportunity... along with many others.... to meet the Pope and receive his blessing. She told how, as she approached where he was sitting, the Pope sneezed -- and, almost as a reflex, she said "Bless you." From that day, for the rest of her life, she took great joy and humor in telling about the time -- in an unexpected reversal of roles -- she got to "bless the Pope".